4E-BP1 regulates protein translations induced by upstream signals initiated by ERK1/2 MAP kinase or PI3-Kinase/AKT/mTOR pathways. Ultimately activation of mTOR, positively stimulates mRNA translation by its two dominant downstream substrates: ribosomal protein S6 kinase, and S6K1. Translation of mammalian mRNA is directed through cap dependent translation; the capping of 5’ end of mRNA by m7-GTP that allows recruitment of eIF4F complex and the binding of 40S ribosomal subunit to the 5’ mRNA cap. eIF4E is a heterotrimeric protein composed of the DEAD-box RNA helicase eIF4A, the cap binding eIF4E and the large scaffolding protein eIF4G. 4E-BP competes with eIF4G for binding to the same conserved patch of hydrophobic residues on the dorsal side of the eIF4E thus acting as a molecular mimic. Activated 4E-BP1 induces rapid cessation of cap dependent translation by binding to the translation factor eIF4E and preventing its interaction with eIF4G, thus inhibiting the pre-initiation complex formation. 4E-BP1 activity is regulation by multiple post-translational modification. 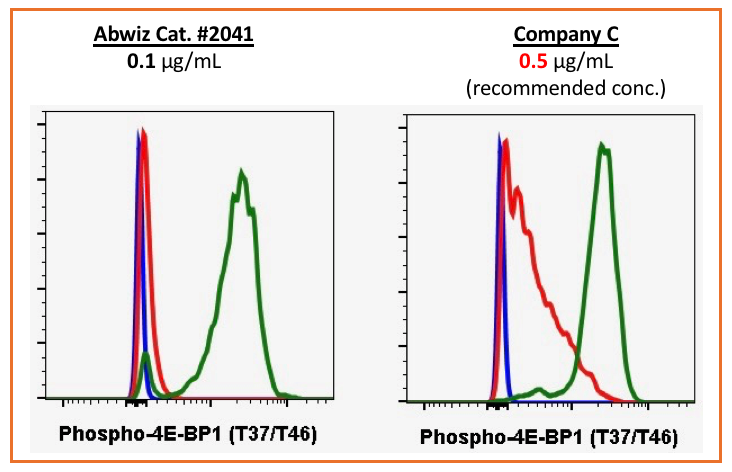 Seven phosphorylation residues have been discovered in human 4E-BP1 including Thr37, Thr46, Ser56, Thr70, Ser83, Ser101, and Ser112. 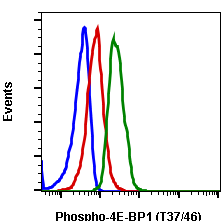 4E-BP1 phosphorylation is up-regulated by extracellular stimuli, including serum, hormones, cytokines, and G-protein coupled receptor agonists while starvation for essential nutrients, growth factor deprivation, ischemia, hypoxia, and ethanol toxicity, strenuous exercise, exposure to glucocorticoids, and infection. Phosphorylation of 4E-BP1 regulates 4E-BP1 binding and downstream regulation. Binding of 4E-BP1 to proteins containing 4E containing domains reduce translation of specific mRNAs which include prosurvival factor Mcl-1, cell cycle regulator Cyclin D3, pro-angiogenic growth factor VEGF among others. In addition, 4E-BP competes with eIF4G proteins for a common binding site on the cap-binding protein, eIF4E. 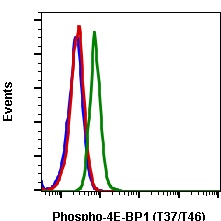 4E-BP1 binding to eIF4E is highly modulated by the degree of 4E-BP1 phosphorylation. 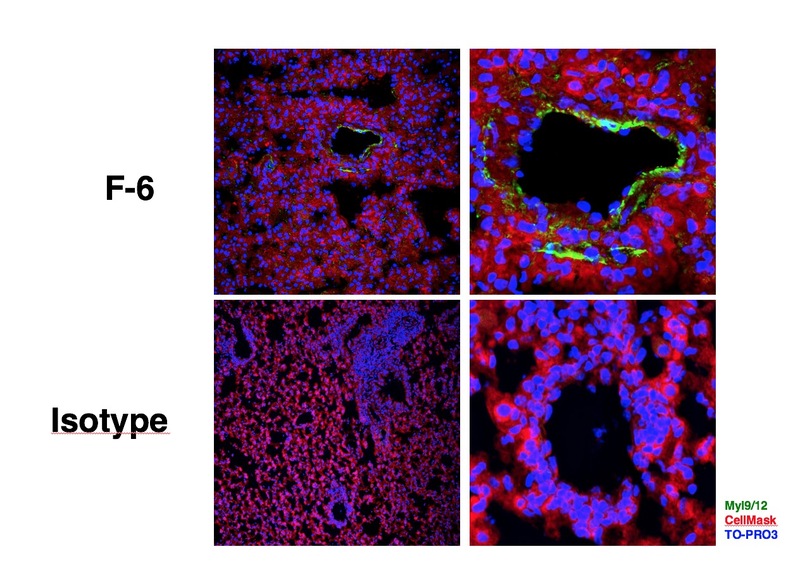 Hyperphosphorylation of 4E-BP1 by various extracellular stimuli activates decreases its affinity to eIF4E and hence eIF4E release. In turn eIF4E has an opportunity to bind to eIF4G forming function eIF4F complex. On the other hand, hypo-phosphorylation of 4E-BP1 increases 4E-BP1 affinity for eIF4E, inhibiting eIF4F formation. 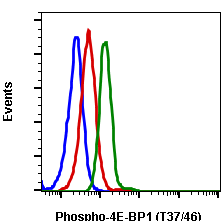 A synthetic phospho-peptide corresponding to residues surrounding Thr37/46 of human phospho 4E-BP1. Hay N. Sonenberg N, (2004) Gens Dev. 18: 1926-1945. Aitken CE, and Lorsch JR, (2012), Nat Struc Mol Biol 19 : 568-576. Peter D., et al., (2015) Mol Cell, 57:1074-1087. Pain VM, (1996) Eur J Biochem 236: 747-771. Fadden P, Haystead TA, Lawrence Jr JC, (1997) J Biol Chem 272: 10240-10247. Kimball SR et al., (1999) J Biol Chem 274: 11647-1152. Kleijn M and Proud CG, (2000) Biochem J, 347: 399-406. Lang CH et al., (2000) Clin Exp Res 24: 322-331. Shah OJ, Kimbell SR., Jefferson LS., (2000), Am J Physiol Endocrinol Metab 278: E76-E82. Immunohistochemical staining of rat kidney cells including peptide blocking shows phospho-specificity for 4EB1T37T46-A5 Cat. #2041. Anti-rabbit secondary antibody staining (red) is punctate in the nuclei. 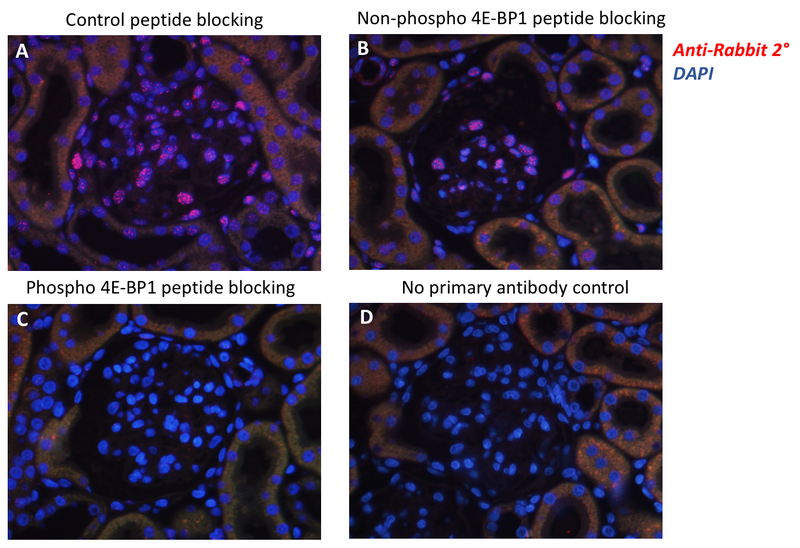 Neither control peptide (A) nor non-phospho 4E-BP1 peptide (B) blocks 4EB1T37T46-A5 staining but phospho 4E-BP1 (T37/T46) peptide efficiently blocks signal (C). 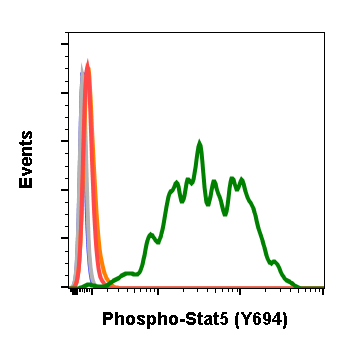 No signal was observed when the primary antibody is omitted (D). The central object in the field is a glomerulus with surrounding tubules sectioned in various orientations. 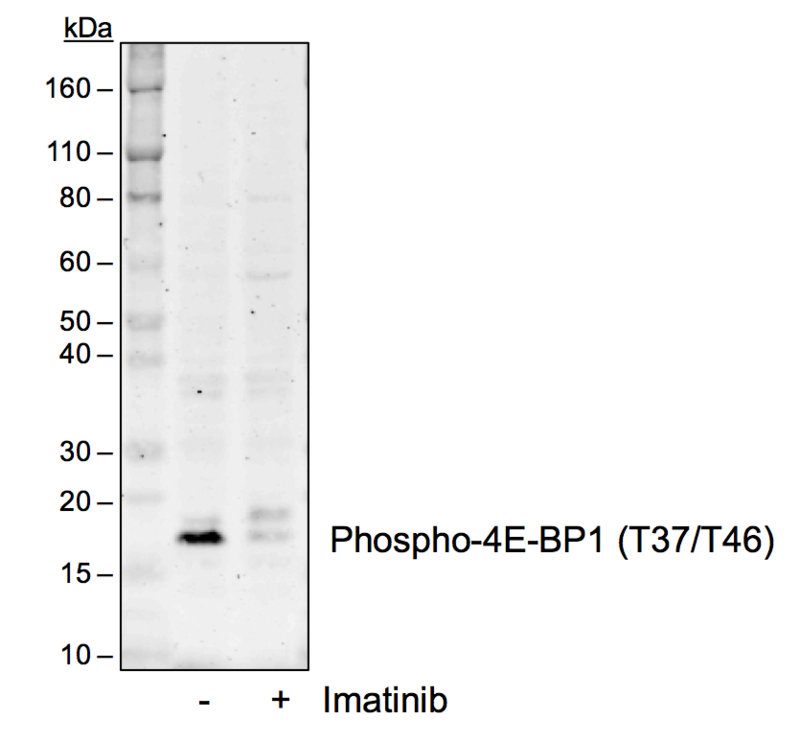 Western blot analysis of K562 cell extract untreated or treated with imatinib using Phospho-4E-BP1 (Thr37/Thr46) antibody 4EB1T37T46-A5 at 1 ng/mL. Cat. #2041. 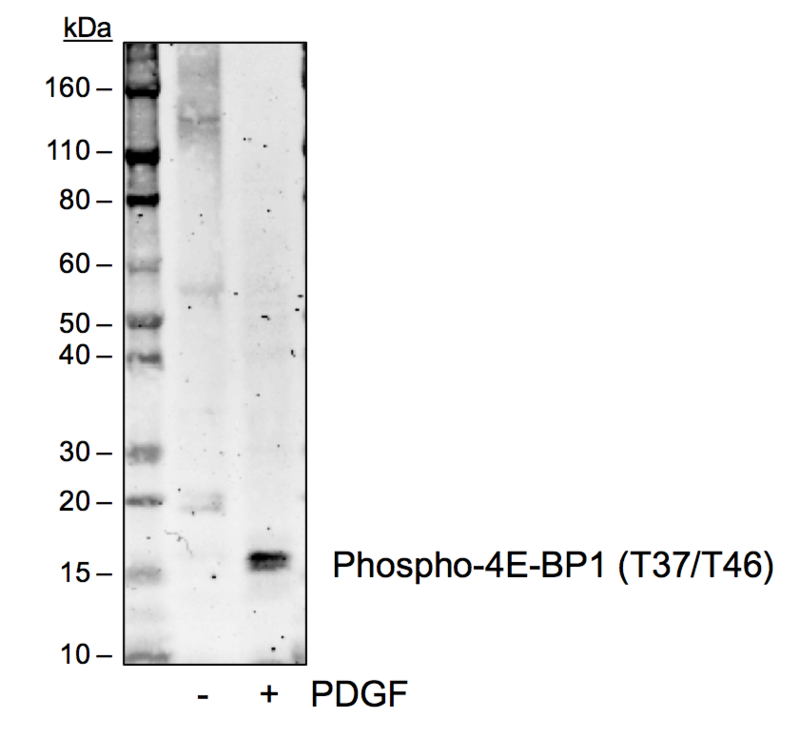 Western blot analysis of NIH3T3 cell extract untreated or treated with PDGF using Phospho-4E-BP1 (Thr37/Thr46) antibody 4EB1T37T46-A5 at 1 ng/mL. Cat. #2041. 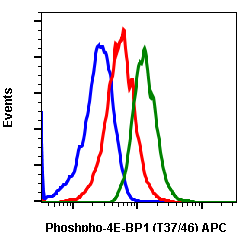 Flow cytometric analysis of C6 cells untreated cells stained with secondary antibody as negative control (blue) or untreated (red) or treated with UV and TPA (green) and stained using Phospho-4E-BP1 (Thr37/Thr46) antibody 4EB1T37T46-A5 at 0.1µg/mL. Cat. #2041. 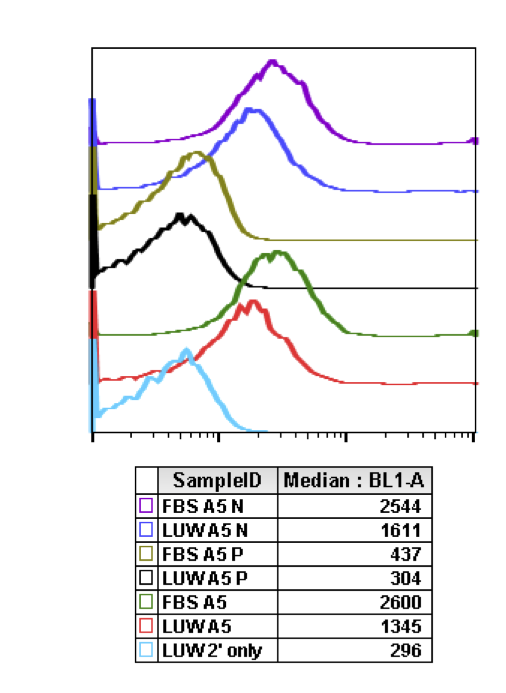 Peptide blocking flow cytometric analysis of Jurkat cells LY294002 plus wortmannin plus U0126 LWU) treated cells stained with secondary antibody as negative control (light blue) or treated with LWU (red) or treated with FBS (green) or LUW and blocked with phospho-peptide (black) or FBS and blocked with phospho peptide (gold) or LUW and blocked with non-phospho peptide (dark blue) or FBS and blocked with non-phospho peptide (purple) using Phospho-4E-BP1 (Thr37/Thr46) antibody 4EB1T37T46-A5 at 0.1µg/mL. Cat. #2041. 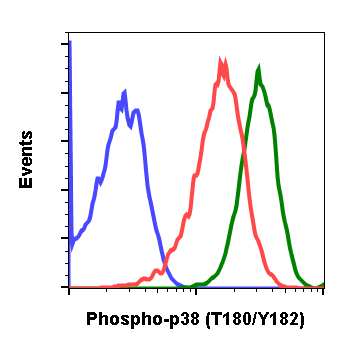 Flow cytometric analysis of Jurkat cells secondary antibody only negative control (blue) or treated with LY294002 + U0126 + wortmanmin (red) or with FBS (green) using 0.1 ug/mL of Phospho-4E-BP1 (Thr37/Thr46) antibody 4EB1T37T46-A5 (Abwiz Cat. 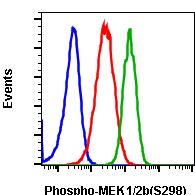 #2041) or Company C antibody at 0.5 ug/mL (manufacturer's recommended concentration).